We’ve got some huge battle releases to share with y’all this week. Hollow Da Don, Dizaster, Charlie Clips, Arsonal, Pat Stay and Bigg K all had battles drop recently and that’s not even all the names. It’s certainly been a good couple of weeks for battles, but we’ve also gotten a pretty big announcement for Summer Madness to look forward to. Fans at King of the Dot’s “Massacre 3” event were treated to a surprise one round battle featuring two of battle rap’s most well known MCs. It’s been revealed that this was a preview of a full battle that’s scheduled to go down between Diz and Hollow later on. It’s New York vs New Jersey in this two on two from URL’s “Double Impact 2”. In what’s allegedly Arsonal’s last URL battle, he teamed up with Shotgun Suge in a battle that ultimately ended up with Charlie Clips showing that he’s still capable of what made everyone fans of him in the first place. B-Magic gets a home game against E. Farrell in his first battle for No Coast battle league. The latest Caddy Royale from Dirtbag Dan’s “Battle of the Zae 8” features Illmaculate, Marvwon, Real Deal, Everybody Knows, and Frank Stacks. Micky Worthless was also supposed to be in it, but couldn’t make it. Naturally that didn’t stop the others from goin’ at him. 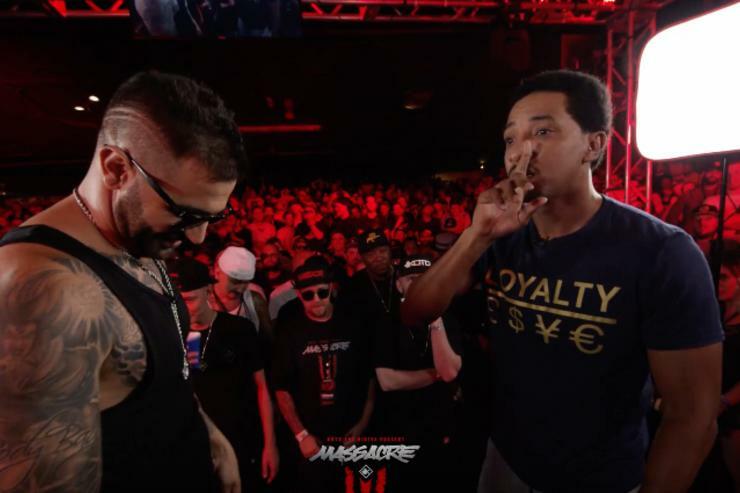 Two of King of the Dot’s favorite battlers clashed in the main event for “Massacre 3”. After Bigg K’s third was spent coming at KOTD, though, it remains to be seen if he’ll still be one of their favorites. All that aside though, both MCs put on a good show of breaking down and roasting their opponents. This battle is being billed as one that will determine who the best performer in battle rap is. With these two, the battle has potential to go down as classic, but also has potential to end in some kind of fight.